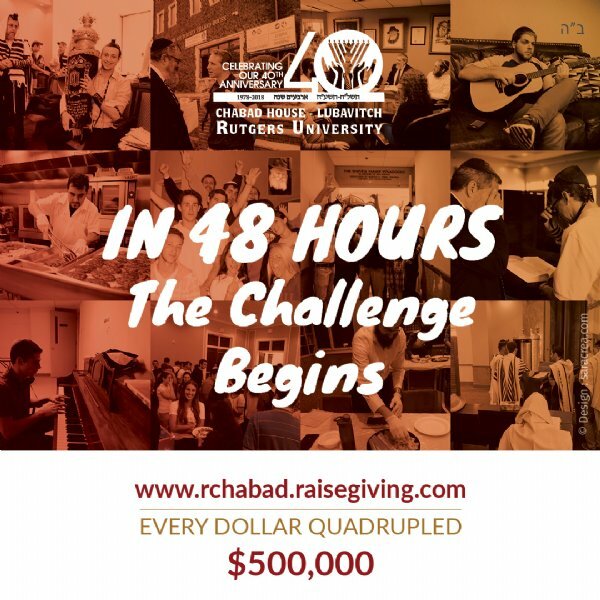 We will be starting our "Giving Day Campaign" in 48-hours to help Chabad House at Rutgers University serve thousands of students round the clock. Our Shabbat and Yom-Tov meal programs attract from 300 -500 students every week. And we never charge for any Shabbat or Yom Tov meal! In fact, all our social and outreach programs are also free to any student! The Shabbat and Yom Tov program alone is budgeted at $400,000.00 annually!!! (The total operating budget of Chabad House exceeds $4,000,000.00). Our goal is to raise $500,000.00 and each $1 will be matched by our generous donors with $3! Please make every effort to send your contribution in this amazing 24-hours only campaign where every amount is quadrupled! !